Husbands can make Ina food too!! After a crazy week of painting and redecorating, Kyle and I hosted a brunch this weekend at our home for a bunch of our friends. It was the first time that we had gotten this particular group of friends together; a group whose only common denominator was Kyle and I. All weekend leading up to the brunch on Sunday we cooked, cleaned, and cooked some more. And when it came time for me to make a grocery store run for a few things I had forgotten earlier in the day, Kyle offered to make this cake while I was gone. The recipe seemed straight forward enough so I decided to let him go through with it…worrying the entire time I was gone, of course. But lo and behold, by the time I returned home (25 minutes later), the cake was all set to go in the oven. Amazing. I know I really shouldn’t have been so nervous though because Kyle can cook and is a decent baker as long as he is patient and follows the recipe as it’s written. But sometimes letting go of the control of what’s going on in the kitchen is a wee bit nerve-wracking…I’m sure most of you can sympathize. So based on the results of this cake, I can say that he definitely followed the instructions this time. I was floored at how this turned out!! And so was everyone else on Sunday. They couldn’t believe that we didn’t buy this cake from a bakery. Yes, it’s that impressive! And when they found out that Kyle made the cake, it became known as “the Kyle cake.” “I’m going for another piece of the Kyle cake.” “Is it ok if I take some of the Kyle cake home with me?” It was really was too funny! 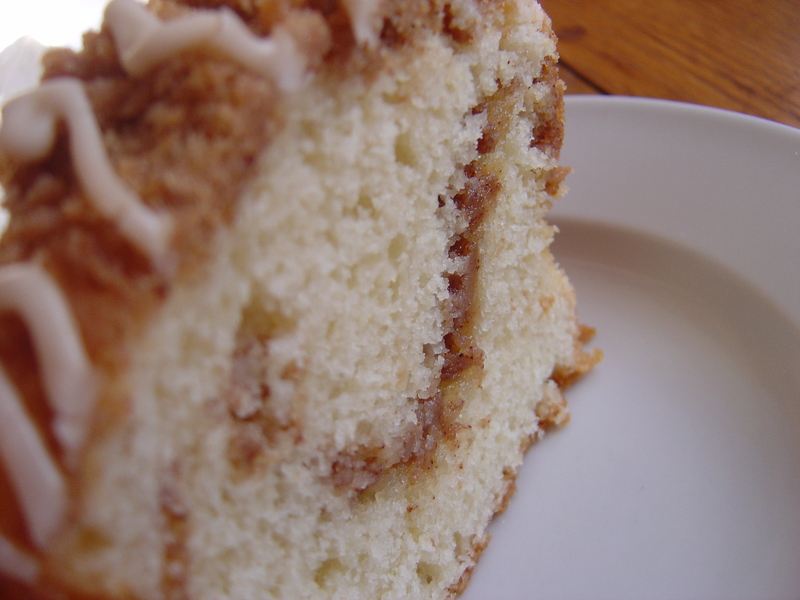 The sour cream in the cake made it so moist and gave it such a nice tangy flavor that paired so well with the cinnamon streusel that ran through the center and covered the top of the cake. And don’t even get me started on the maple icing! Holy crap what an addition that was!! I know I’ve said before that this cake beats out Entemann’s but this one definitely is right up there at the top of the list! I’ve already got another occasion lined up for this cake which is a good think because between what our guests took home with them and how much we’ve eaten in the past two days, the cake is gone…and I’m craving some more!! source: Ina Garten, Barefoot Contessa Parties! Yum! Looks delicious. Great job Kyle! That looks awesome! I think my office mates would LOVE that. Oh heck, what baked good don’t they devour? I have never made a coffee ake but I need to try it! This looks extra yummy! Wow! That does look amazing! I wish my man would bake! Oh boy, where is my bundt pan! 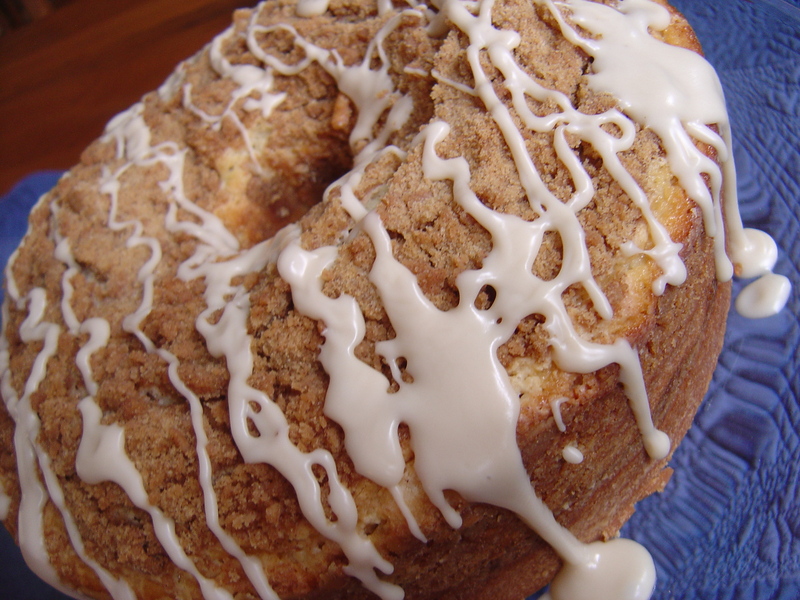 That looks so good, especially with the maple glaze AND streusel. Kyle did a fantastic job! That is an impressive looking cake and by the sounds of it just as tasty as it looks. I’m sorry but even if the glaze didn’t make the cake it looked goooood drizzled on top, of course it was holy crap good so the point’s moot. You go Kyle! This cake looks delicious! I think I need to introduce Ina to my husband…maybe I’ll get the same results as you did! Go Kyle! Looks like he did a great job. Sounds so yummy! looks great! gotta love Ina. i need to try this one! 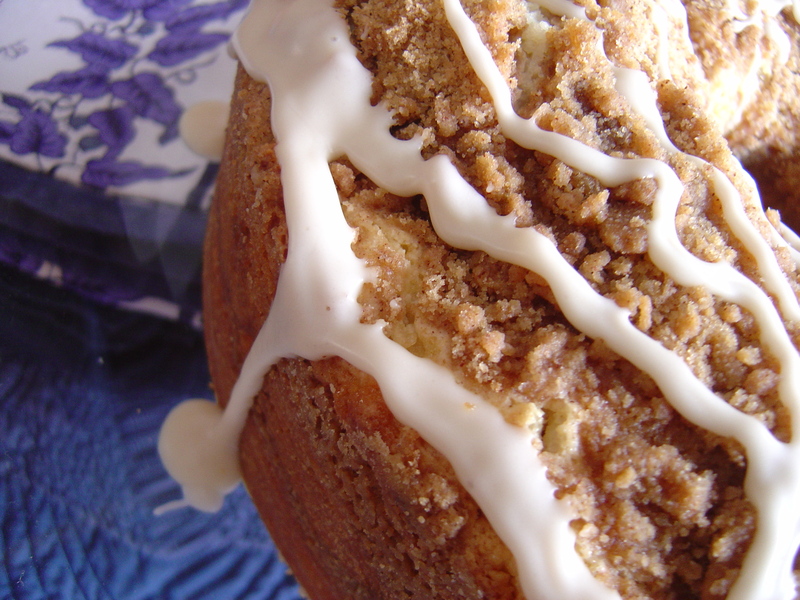 how did you get it out of the pan without losing all the streusel topping? The cake is baked in a tube pan (not a Bundt pan) which has a removable insert that holds the cake when you push up from the bottom of the pan (similar to a tart pan).